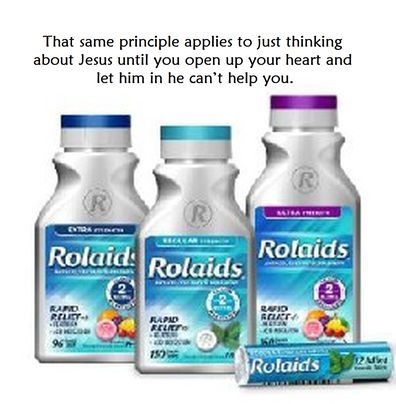 Remember the commercial that asked the question, “How do you relief?” And then someone answers, R – O – L – A – I – D – S. Remember it? Antacids may be good for an upset stomach but do nothing for the spirit. However an upset spirit may cause all kinds of physical issues that physical resources will be of no help. With those thoughts in mind here’s how you spell relief from an upset spirit, J – E – S – U – S! On a side note: One of the best gifts the Holy Spirit gives YOU is the gift to believe!